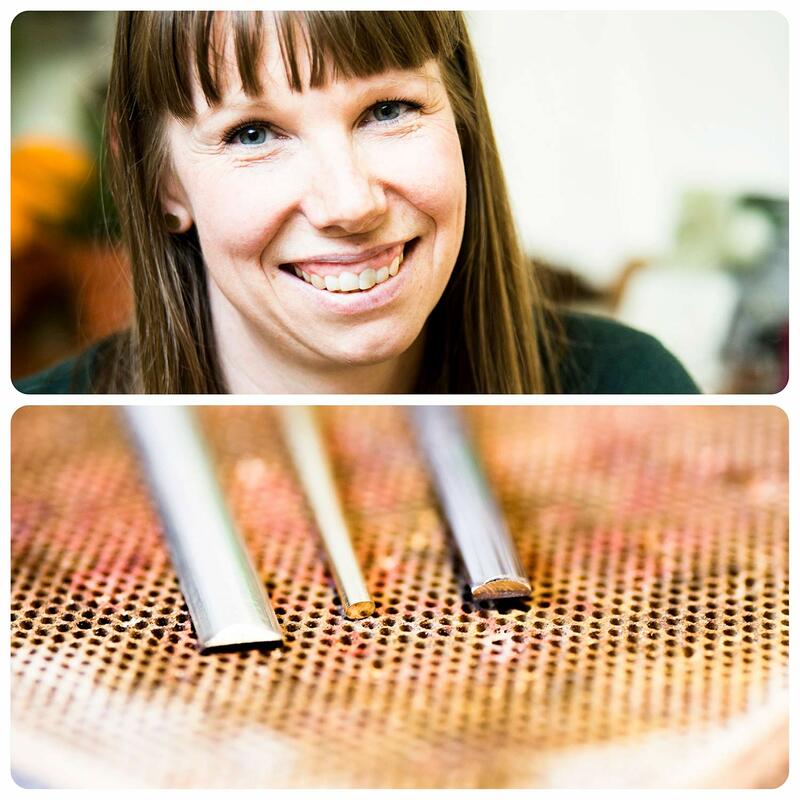 Donna Barry, originally from Wales runs her jewellery design studio in Edinburgh. Her designs are particularly inspired by the natural shapes and patterns which you can find in numerous of her jewellery pieces. I interviewed Donna a little while ago and asked her all the things about making your own wedding rings. How did it all start - making wedding rings? With a degree from the Edinburgh College of Art in 2001 and lots of experience in jewellery making, Donna had a client in 2011 who came over from the Isle of Arran. This lady wanted to make her friends’ wedding rings in white gold and she asked Donna to help and show her how to make them. After a successful day in the workshop, Donna’s business partner had the idea to offer this service to couples in Scotland. After some initial research, they found out that hardly anyone was offering this service in the UK. They could only find one competitor in England. 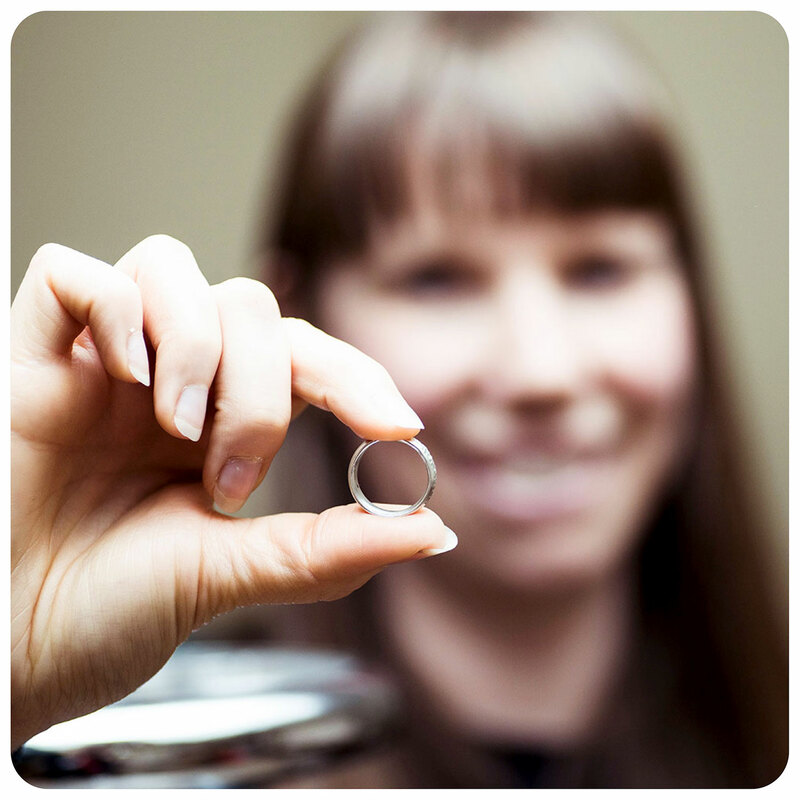 The wedding ring workshops are an additional service to Donna’s main jewellery business in Edinburgh. She specialises in precious jewellery, silver and gold with precious stones. So producing wedding rings is just natural extension of the business. Donna dedicates two full days per week to this side of the business when the workshops are run. How often are the workshops run? 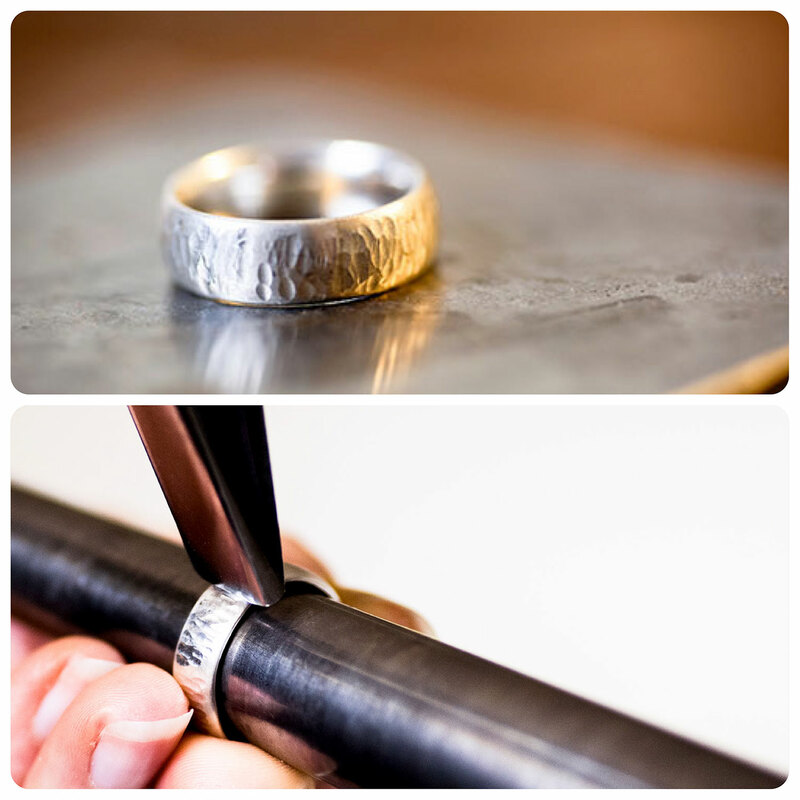 Donna runs the wedding ring making workshops twice a week, all year round. The workshops are run on Saturdays and Mondays. The workshops are a lot more popular in the first 6 months of the year at the run up to the main wedding season, and less busy between July and December. So what happens during the ring-making workshop? It all starts off by heating the metal to make it more malleable to work with. One end of the metal strip is filed to make it straight. Then the correct length of the strip is measured for your finger, and the other end is cut off, and then this end is filed straight too. We then bend the ring with pliers to get both ends to meet nice and neatly. The ends are then heated up and some solder is placed on the join. Once the strip is soldered, we use a mallet to hammered it into shape to make it round, and until it lies flush on the work bench, so it’s not wobbly. At this point, it’s a good time to stop for lunch. After lunch, the couple will work on two different work benches. They file the join and solder and get rid of any visible join and plier marks. The ring is then sanded with different graded emery paper, and now the rings are ready for polishing. Can we take the rings with us on the same day? Depending on the metal, the rings can be taken home the same day. If the rings are made Platinum, Paladium or 14ct gold and 18ct rose gold, the couple will make a silver ring on the day, which is then sent away to a casting company, so that it can be cast into an exact replica and produced in the desired metal. Platinum, Palladium, 14ct gold and 18ct rose gold are very hard metals and much more difficult to work with. You cannot actually buy 14ct gold bullion in the UK. You can only send the silver ring to the casting company and they will produce the ring for you. Rings made from all the other metals can be produced in the actual metal and can be taken home the same day. 9ct gold (white, yellow, rose gold), 18ct white or yellow gold can be used for making wedding rings without the casting process. Silver is a very soft metal, and Donna would advise against to use silver for wedding bands, as it easily bends and scratches. The couple can keep the silver ring they made if they wish. We will shop the completed silver ring model to the casting company. They will then produce a silicon mould, and the desired ring metal is poured into he mould for the production of the actual wedding ring. The silver ring is sent back to Donna, with the wedding ring, for the couple. How long does it take for us to get the wedding ring back from the casting? It takes about 3 weeks for the rings to be back with Donna in Edinburgh. What materials do you offer? Can we bring our own gold from - say grandma’s old ring? We tend not to do that, but it is a possibility. All we can do is send those rings to the casting company for melting them down and use the gold of those ring for the actual new wedding ring. So the rings are not actually produced or altered in the workshop with those metals. Can we make a ring with a stone in it, or even more than one stone? We will make the wedding band on the day (as explained above). For precious stones, we would send the ring to a stone setter who will complete the ring with the desired precious stones. Donna can certainly help sourcing the stones. The stones that are used for wedding bands usually sit flush within the wedding band. We don't tend to create wedding bands with rings sitting proud on top, as often seen in engagement rings. Can the ring have a stone on the inside? Can it have our names on the inside? Engraving can be arranged by Donna. This incurs extra costs, and the couple can determine the font and wording for each ring. How long in advance do we need to book the workshop? This depends on the metal for the rings and the wedding date. For example, if your wedding is on the 1st June, you should get in touch before Christmas or in the new year to get the process started. The workshop can then be arranged for February / March, and the rings are usually delivered around 3-4 weeks after the workshop. If you live locally, you can pick up your rings from the workshop, or we can send them out using special delivery. How many people take part in one workshop? The workshops are designed for 1 couple at a time. The workshop costs approximately £275 for the couple. The material of the rings is paid extra. This includes Donna’s time, the workshop, lunch, a CD with images, and dog time with Otis. Donna provides a full price list on her website. Is it possible to come as a couple but only make one ring together as my partner doesn't want a ring?